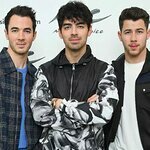 The oldest sibling in the Jonas Brothers – Kevin Jonas – will appear on NBC game show Minute To Win It on May 23 to raise money for the group’s charity, Change for the Children Foundation. The show sees contestants take on a series of games – each lasting a minute – to win $1 million. The Jonas Brothers started the Change for the Children Foundation to support programs that motivate and inspire children to face adversity with confidence, determination and a will to succeed. They raise money for five charities: Nothing But Nets, the American Diabetes Association, the St. Jude Children's Research Hospital, the Children's Hospital Los Angeles, and the Summer Stars Camp for the Performing Arts. Tomorrow night, April 18, will see the Brothers honored for their charity work by the TJ Martell Foundation at the Roseland Ballroom in New York. More information about the gig can be found here.